1. Roll; Don't Fold As you pack, roll your clothes instead of folding them. You'll be able to fit up to two times the amount of clothing by rolling them as you would by folding them. 2. Pack your "Iron" And by iron, we mean Downy Wrinkle Releaser Plus. The 3 oz travel size meets airline standards. Slip it into your carry-on bag, and with a simple spray, you'll be wrinkle free all trip long. (It's also a great fabric refresher if you have to wear your clothes more than once on vacation.) Click here to read more and grab a coupon. 3. Bring an Empty Water Bottle After you get through security, several airports have filtered water stands to fill your bottle. You'll also find that most airport cafes will gladly fill your water bottle as well. 4. Snap a Picture If you're checking your luggage, snap a picture of your suitcase contents before you leave the house. If the airline loses your luggage, you'll be able to use the picture to prove the value of the contents. 5. BYO Blanket Blankets on airlines are hard to come by these days - and they're not always washed between flights. If you tend to get cold on planes, or you're going to be flying overnight, pack your own blanket to stay comfortable. 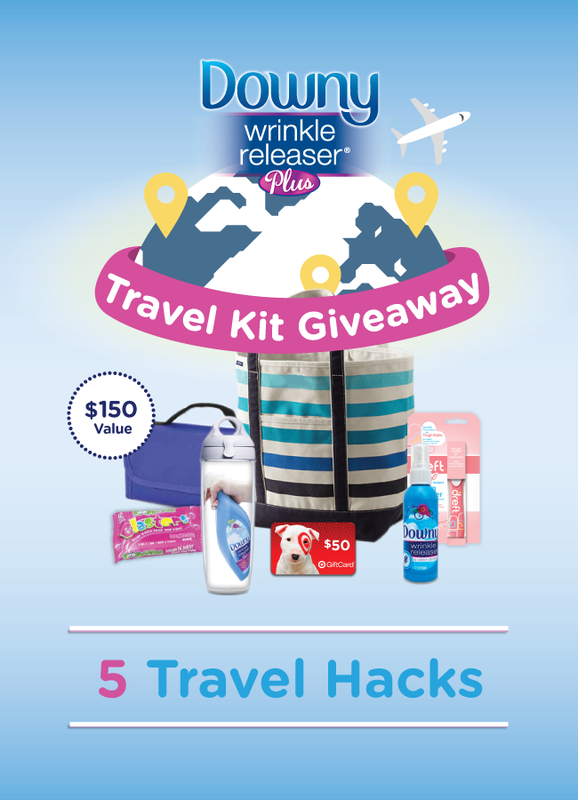 One lucky winner will receive a travel pack valued at $150, including a travel tote, a Tervis Tumbler, Downy Wrinkle Releaser Plus and a $50 Target gift card. Giveaway ends at midnight on Friday, March 20, 2015. Open to US and Canada. Complete the form below to enter. Good luck!